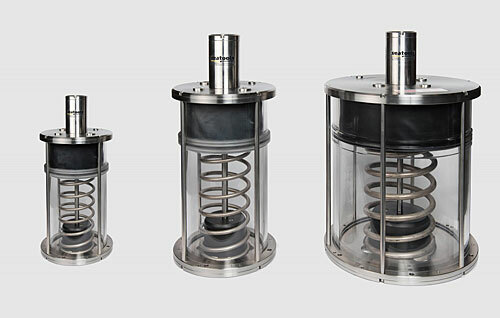 Dutch subsea technology company Seatools has announced the introduction of a new subsea hydraulic compensator range: the Advanced series. This new subsea compensator range, based on the preceding Hyco range, incorporates more than 15 years of experience and field feedback, and delivers serious improvements in robustness, durability, and standardization. Seatools, a specialist in subsea hydraulic systems, performed an extensive development trajectory that led to the Advanced series. The new range, meant for heavy-duty subsea hydraulic systems – such as subsea vehicles (e.g. ROVs and trenchers) and dredging systems (suction tube SHPU compensation) – features a strongly improved mechanical design. After reviewing its design for exposure to extreme temperatures and long-term material behavior, several significant improvements were made in the areas of mechanical design and material selection. The range’s revised design, largely based on stainless steel, is now more robust and demonstrates increased durability. The updated design facilitates higher pre-pressures, which reduces the risk of water and air ingress and increases subsea hydraulic system reliability. The new range complies with the industry-wide trend towards standardization and simplification. Level sensor data output, for example, can now be interfaced with all popular industry data communication standards, including Profibus and CANbus. Furthermore, the same components are incorporated across the series. This enables more effective spare part stocking strategies and higher stock part availability. The Advanced compensator range, which complements the basic, heavy-duty, and ultralong lifetime compensator ranges, underwent extensive durability tests under a variety of conditions, such as extreme temperatures ranging from -20°C to 70°C. Moreover, subsea compensators from the Advanced series have recently been applied in various custom-made ROV projects and have reached TRL level 9.